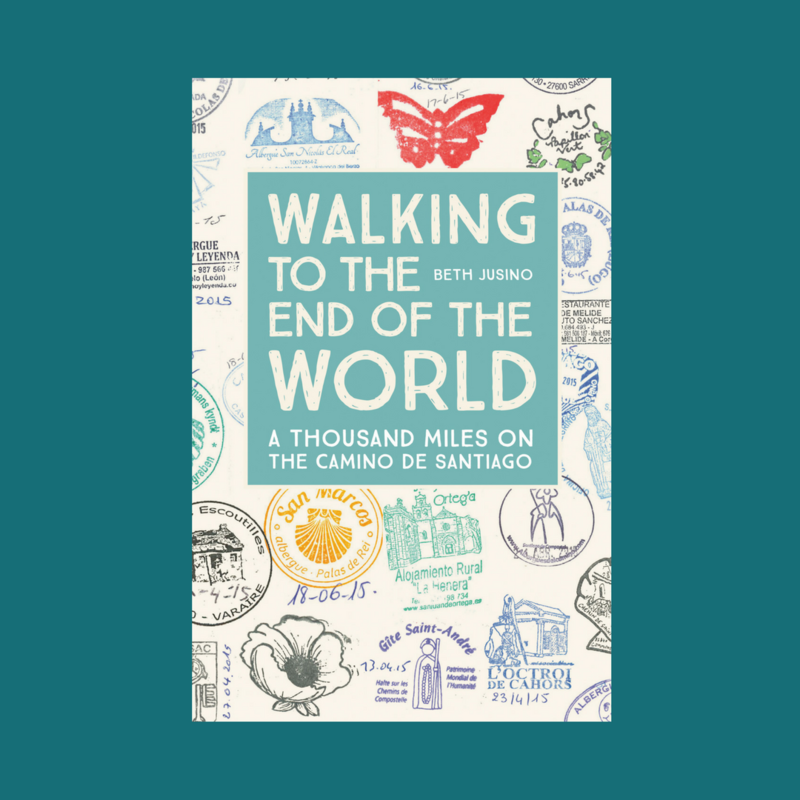 What is the Camino del Norte like? Lots of people have asked me that, and there’s no one good way to answer. So here is the story of a typical day on the Camino del Norte, full of moments of breathtaking beauty, mixed in with moments of fear, confusion, surprise, and a bit of (off screen) swearing. We wake in our municipal albergue at 7:00, which is about the time that things start moving on the Northern Camino. With cool temperatures and spectacular views, plus albergues that don’t open until 2 or even 3:00, most people avoid the noisy pre-dawn departures that plague the Camino Francés. We follow the arrows through town, along streets lined with gated houses big enough to be called mansions, many of them now for sale. One house has a peacock strutting in the yard. The houses give way to farmyards full of goats, which give way to our first steep hill of the day. We’re in the woods, shaded from the sun, and everything feels fresh and beautiful. We drop our packs and climb around in the ruins of what was once a small church, but this is just a warmup. The ocean is calling. The forest gives way to open ground, and to the cliffs and bluffs we’ve come to know. We climb and climb, the sparkling water spread out to the north with nothing to block our view, or our feet if we fall. “Be careful here in foggy conditions,” says the guidebook, and my stomach tightens a little at the thought. This would be a whole different experience with low visibility. But today is bright, almost blindingly so. Goats climb the pointed rocks above us, their presence given away by the sound of their bells. Paved roads become gravel, and then narrow to rocky walking trails, and then…where did it go? We’re in fields shared with horses and cows, no fences between us, and we’re following their footsteps. Is this the way? Is that? We run into other pilgrims as lost as we are. A French mother and daughter go one way, scrambling through brambles along what I think is a horse trail. Another man, I think from Belgium, pushes forward and then calls us. He’s found a small yellow arrow painted on a rock near the ground. We follow him. Eventually we all end up on a road, and there, finally, is a clear yellow arrow. It’s mid-morning and long past time for a break when we descend the steep, knee-straining hill into Laredo. We’re only 7 kilometers into the day, but it feels like we’ve already had a full day of adventure and beauty. But as the commercials say, wait! There’s more! Back at sea level, we enter Laredo’s old city, which dates back to Roman times. The cathedral is just opening as we pass, and so we pause to put our packs down again and explore. 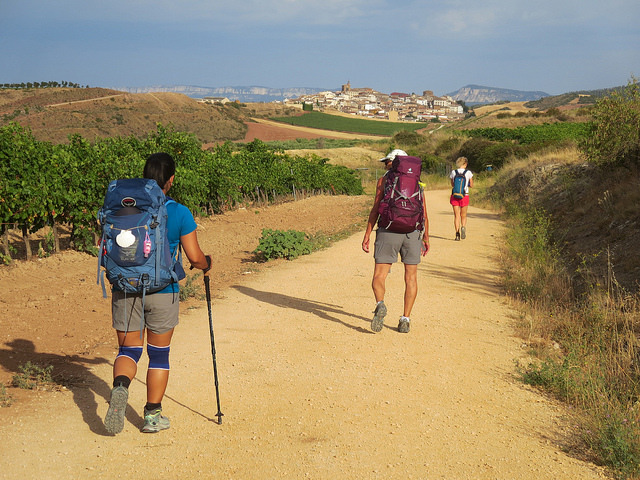 This was something I loved to do on my first Camino walks across France and Spain. The architecture, art, and engineering feats of these old buildings, and the reverence that still fills them, fascinates me. Plus, there are usually pews where I can rest my feet for a while. We linger on the worn, uneven stone floors and consider the votive ship hanging above our heads. This is something I’ve seen before on the coast but never inland, a way to bring God’s blessing not just to land but to sea. As quickly as we enter the old city, we leave it behind. The Norte is full of places where you could linger if it wasn’t for the draw of what comes next. Modern Laredo is a vacation town with a population of 12,000 and a 5-kilometer beach that draws tens of thousands of tourists every summer. In mid-May the long stretches of white sand are mostly empty – holiday season here won’t really launch until July – but there are a few dozen determined, mostly retired people who are already promenading the white sand in very small bathing suits. We can walk along the paved promenade or take a shortcut along the beach. The sand is packed and easy, and at low tide we can cut distance off our crescent-shaped walk. We choose the water. I’m footsore by the time we reach the end of the beach, where we’re supposed to catch a ferry that will carry us across the channel to Santoña. But there’s nothing here – no dock, no ticket building, nothing but a long boardwalk that ends in the water. We follow it and wait, uncertain. This feeling of uncertainty, this lack of control, is my familiar companion here, so far from the predictable routines of my normal life. When every day, and often every hour, throws you into a place you’ve never seen before, it’s often hard to keep up. And that’s part of the experience. After about ten minutes, we see a boat approaching. Is this our ferry? How could it be? But yes, it just pulls right onto a beach, and a teenage boy drops a ramp and waves us forward. We board, pay the nominal fee of 2 euro, and it carries us across the water to another new city. There’s a dock here, and a paved promenade. We pause for a celebratory picnic of whatever’s in our bags and then push forward. The town is crowded with people enjoying the sun, and I think it would be a good place to explore. The sun is hot, and we walk for another 5 kilometers on hard pavement, along uninspiring roads. For almost an hour we skirt the walls of a prison complex, barbed wire on top of blank walls. I’m really footsore now, and tired. But we’re so close. All we have to do is “climb a rocky footpath” and then “descend” to a beach. I am not prepared, physically or mentally, for what comes next. The climb is short, probably not more than a few hundred meters, but it’s almost vertical. The dirt crumbles under my feet as I haul myself up with my walking poles, swearing at the path and the guidebook and the ocean and the sun and Eric (who’s scampered up ahead of me) and whatever else I can think of. I’m afraid of falling, I’m afraid I can’t make it to the top, and I’m just really, really tired. But as Newton said, what goes up must come down, and so once I reach to top of the hill, I have no choice but to pick my way back down the other side. The final descent of the day. Really, this time. I wander out onto the beach and soak my feet in the cool water, and poke around the rocks, and study the outline of the town. Because just wait, there’s always more. My husband is currently walking the Norte. Thanks for sharing what a day can be like. Beautiful and difficult! That climb up El Brusco is unforgettable, but you are right, the view is great.